Greece’s anti-austerity SYRIZA party is leading in opinion polls days ahead of a general election on Sunday. The country’s massive €317 billion debt remains a key point of disaccord among experts and politicians. 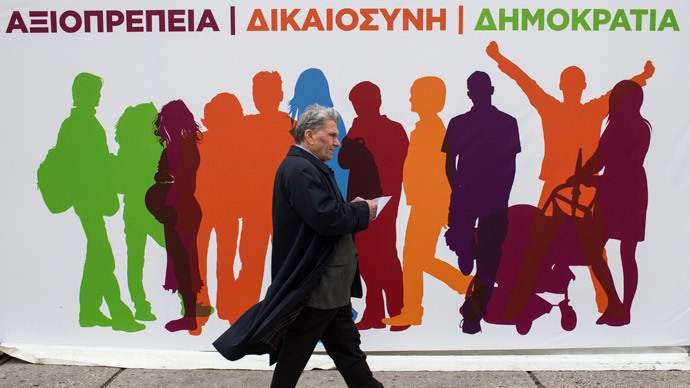 Recent polls show SYRIZA is leading among voters and is three percent ahead of the ruling New Democracy party, according to a survey published in the To Vima newspaper on Sunday. Should the leftist Coalition of the Radical Left Alliance (SYRIZA) win the election on January 25, it will abandon austerity measures in favor of its own program to repay the national debt, said the party’s leader Alexis Tsipras in an interview with local Antenna TV channel. #Syriza consolidating lead in polls. Widespread feeling here: it can't get any worse, why not try something new. Ready to gamble, #Greece? His party also opposes EU sanctions against Russia saying they pose a threat to peace and stability throughout Europe. The Greek government was forced to impose strict fiscal austerity measures in exchange for €317 billion in financial assistance from the troika of creditors of the ECB, IMF and the EU. Most of the funds were used to bailout Greek banks and only around 10 percent of that has reached the people. As a result of a continuous crisis, child poverty in Greece has almost doubled since 2008, according to a UN report. The rate of youth unemployment has risen above 50 percent. Mental health organizations say the suicide rate in the country has soared by 45 percent. If SYRIZA doesn’t receive a majority of votes in parliament enough to form its own government, it will need to form a coalition with some smaller party that would accept the course of SYRIZA. Germany and several other EU countries are cautiously negotiating a possible scenario in which Greece may leave the eurozone. They believe the EU can handle a Greece exit from the single currency as other member countries have implemented the necessary reforms since the crisis in Greece first erupted. Alexis Tsipras, in turn, said that Greeks "should not be concerned about the fate of the euro, but be interested in saving the national economy and preventing a social disaster." The SYRIZA leader also said the country will fulfill its obligations towards the European Union. "We respect our institutional commitments within the European Union,” he added. One of the biggest economic implications of four years of austerity in Greece is the future of the country’s massive €317billion debt which has become a hot topic for policymakers and experts. Christine Lagarde, a head of the IMF warned on Monday that changing the debt conditions would raise a query about Greece’s international credibility. Greece’s debt isn’t payable and that has to be acknowledged by the creditors, Ann Pettifor, director of Policy Research in Macroeconomics, told RT. She believes the EU imposing the austerity policy has contributed to crushing demand and the contraction of economic activity in Greece, which contributed to a rising unemployment rate and a deterioration in living standards. Tsipras said should SYRIZA win it will want to convene an international conference to renegotiate the terms of Greece’s debt, similar to a summit of 1953 in which the debt of West Germany was cut by 50 percent. SYRIZA’s opposition to austerity and talks about its possible exit from the eurozone has been heating up political uncertainty. Greek banks have raised concerns over tightening liquidity conditions, as the banking system lost around €3 billion ($3.47 billion) in deposits in the past two months. Two of the country’s biggest lenders, Eurobank Ergasias and Alpha Bank, said Friday they had formally requested access to an emergency cash facility from the country’s central bank. The moves are considered precautionary, as none of the lenders is facing an immediate cash crunch, people familiar with the matter told the Wall Street Journal. However, such precautionary measures will cost as the interest rate from The Bank of Greece is 1.55 percent compared with 0.05 percent from the European Central Bank. Greek stocks on December 29 plunged to an 11-year low on the news of the snap elections after parliament failed to elect a president in a key vote. The negotiations between Greece and the troika about a credit line for the latest €240 billion bailout were suspended and their progress will depend on the result of the election. Last week, due to political uncertainty, Fitch revised its outlook on long-term debt rating for Greece to negative.